First, for those who might have missed it, here’s a conversation from This Week in Virology (TWiV), posted a few days ago. Dr. Racaniello and I discuss the CDC, NICE, Esther Crawley’s ethically challenged behavior, the CMRC, and other stuff. I would like to congratulate NICE on its decision to pursue a full update of CG53, the CFS/ME guidance, rather than accept the surveillance report’s recommendation to leave it as is. The Guidance Executive made the right call, based on the current science—and given the international controversy over PACE trial and other CBT/GET trials. In NICE’s announcement, the list of concerns about the 2007 guidance was a fair accounting of what has troubled people for years and led to the outpouring of stakeholder comments opposed to the initial recommendation. The decision to pursue a full update leaves some unanswered questions. Given that the new guidance might not be available until 2020, I am hoping you or someone else at NICE can shed light on these issues. The first involves the official status of the current guidance. The second involves references to CFS/ME elsewhere within NICE that do not appear to be aligned with the decision to fully update the guidance. 1) What is the official status now of CG53? Is it considered “provisional” or on stand-by in some way? Or does it remain fully in force? In other words, if National Health Service clinics and doctors claim to be following the “NICE guidance” for CFS/ME, do they also have an obligation to inform patients that the current version has been deemed no longer fit for purpose and is undergoing a “full update”? If these clinics and doctors prescribe CBT and/or GET, citing NICE as evidence and support, do they now have an obligation to explain that the effectiveness of these two treatments is under serious question? 2) The decision to pursue a “full update” suggests that NICE has joined the international scientific community in questioning whether psychological and behavioral approaches are appropriate for this illness—especially given the extensive evidence of physiological dysfunction. Does that mean NICE will reconsider other references to CFS/ME in agency documents? So far, patients and advocates have noted two sets of references to CFS/ME that do not appear to reflect the updated NICE position on CG53 and the illness itself. Chronic fatigue syndrome is included in the list of thirteen conditions identified by “the NICE expert IAPT panel” as appropriate targets for interventions developed through this program. The IAPT site indicates that these interventions need to be consistent with NICE guidance. The site then refers readers to CG53 but makes no mention that this guidance is undergoing a full update. Why is chronic fatigue syndrome still listed under the IAPT program? Does the Guidance Executive agree that it should be removed, since it is not a psychological or psychiatric disorder and the use of CBT and GET is very much under question? If it is not removed from under the auspices of IAPT, does that mean NICE intends to encourage the development of digital methods of delivering CBT and GET to people with CFS/ME, even as the guidance itself undergoes a full update? Is the Guidance Executive aware that inclusion of CFS/ME in the IAPT program creates enormous concern among patients and advocates specifically because it suggests NICE might adopt or endorse some version of FITNET-NHS? That is the trial in which Professor Esther Crawley is examining the delivery of online CBT to children, based on the purported success of earlier Dutch research. Is the Guidance Executive aware that, as with the PACE trial, critics (including me) have documented serious methodological flaws in both the Dutch FITNET study and Professor Crawley’s own work in this field? A second set of references to chronic fatigue syndrome is in a recent draft guideline on “suspected neurological conditions”—essentially, a primer on the symptoms and signs that might indicate a neurological condition and trigger a referral to specialist care. NICE published the draft in August and sought stakeholder comments. In its stakeholder submission, Forward ME noted that the draft guideline includes several unfortunate references to chronic fatigue syndrome as being a “functional” symptom or disorder. Psychiatrists and other adherents of the biopsychosocial field have long classified chronic fatigue syndrome, fibromyalgia, irritable bowel syndrome, and other conditions involving so-called “medically unexplained symptoms” as functional somatic syndromes or disorders. Given the current effort to revamp the CFS/ME guidance and the significant evidence of actual physiological dysfunctions, does NICE feel comfortable at this point describing the illness elsewhere as a “functional” symptom that is “not primarily” organic in nature but is “likely to have an emotional basis”? Smoke & Mirrors all the way. The Psych Collaborative will push it as a chronic mental illness until their dying day. They know full well that ME is a documented Neurological issue and has been included in the WHO ICD since 1969. They never say ME is a mental illness but they say ME/CFS or CFS/ME, CFS, CF, plus all their other fun alphabet games. Thanks for writing to Sir Andrew. I look forward to his response. Very important questions to be asking, I look forward to reading the reply. Very pleased to see this communication to NICE. For too long the level of ‘double speak’ emanating from the UK on the pathology and treatment of M.E. has been tacitly allowed to continue unabated. Time to demand straight forward answers and to put an immediate halt to the harmful therapies employed by this medical cabal. It is a FACT that patients have been seriously harmed by following recommendations by their doctors based on the existing guidelines. It is a FACT that patients have been horribly abused by those who blindly insist on these guidelines being followed despite adverse reactions. It is a FACT that parents have been accused of Fabricating Induced Illness if they dare to protect their children from undertaking the recommendations in these Guidelines. It is a FACT that patients have been refused benefits or access to other disability supports unless and until they comply with therapies which will make their condition even more severe. It is a FACT that once that happens and they can no longer ‘appear’ at services they are either ignored or discharged from any service support and are left to rot on their own at home. Time to stop the rot. Thanks David. Thank you for writing such a clear exposition. Hopefully this makes it much harder for NICE to sweep the internal contradictions in their approach to ME under the carpet or to allow the persistence of the bizarre PACE corruption of CBT and the potentially harmful GET. This creeping expansion, without any evidential support, of MUPS here in the UK and in Holland is particularly worrying. It is empire building by a small group that harms not only service provision for people with ME but also inappropriately diverts funding from actual psychiatric conditions. Can’t comment much more than previous comments but a big fist pump to you David for your continuing support to this issue. Thank you for asking. The answers should be interesting! These questions need to be answered, history will also judge NICE on its role in mistreating ME patients and denying them biomedical care. 250,000 patients are being discriminated against in the U.K. and being denied biomedical treatment for a biomedical disease. Thank you David excellent as always. Well said, David. Unfortunately I am too brainfogged to write eloquently, but I thank you for expressing the concerns of the ME community so well. I am sure NICE are aware that these issues are now being monitored beyond the ME community and international researchers are questioning the poor methodology used in research which NICE refers to, relies on, and appears to accept without due diligence. Thank you, David, for turning your laser-sharp focus to the issue of ME/CFS being classified as a functional disorder or MUS/MUPS. It seems that the standard play for the psychosocial school is to blur the boundaries of the disorder, to make it so vague that almost anything will meet the diagnostic criteria (& which will then necessarily include people with high prevalence, mental health conditions (such as depression) as their primary condition, and for whom exercise is likely to be helpful). And, of course, to also ignore, dismiss and undermine the biological evidence which is growing all the time. Honestly, what annoys me most is that they have the energy to keep shifting the goal posts. They seem to be counting on the fact that we won’t have the energy to keep fighting them. And we don’t, as individuals. What they haven’t counted on is that (a) research is confirming what patients have said all along, (b) biomedical research has now brought us healthy allies, who do have the energy to fight them (thank you! ), and (c) we might not have the energy as individuals, but we are now an enormous collective. Ritiximab results are on the horizon, people. We have got this! This is yet another outstanding piece of work by Dr David Tuller. I do not recall ever reading such crystal-clear analysis as I do whenever another one of David’s papers is published. They are so good that they leave no possible misunderstanding of what the issues are. Yet, experience leaves everyone expecting further denials and misrepresentation from those in the UK are responsible for healthcare policy. Important questions David. Thank you for ensuring NICE knows that it is being observed and will be held accountable. Another point I hope you address soon is the need for transparency with the review. Foremost is the composition of the panel. Another is what documents will be reviewed. I think in the rational they did not include ARQH, IOM, & the CDC dropping of Oxford, PACE, CBT, & GET. Well done. These questions definitely need answers. Great questions! So glad you’re asking these questions now and not ‘waiting and seeing’, both because they’re issues that need to be addressed so that the full review and update is truly independent and comprehensive, and because we’re all still living with it – our lives and illness don’t go on hold until the NICE guidelines are updated! Thank you as always David. Just a little note on the interim period, as I don’t have the wherewithal to read all of your letter at the moment. 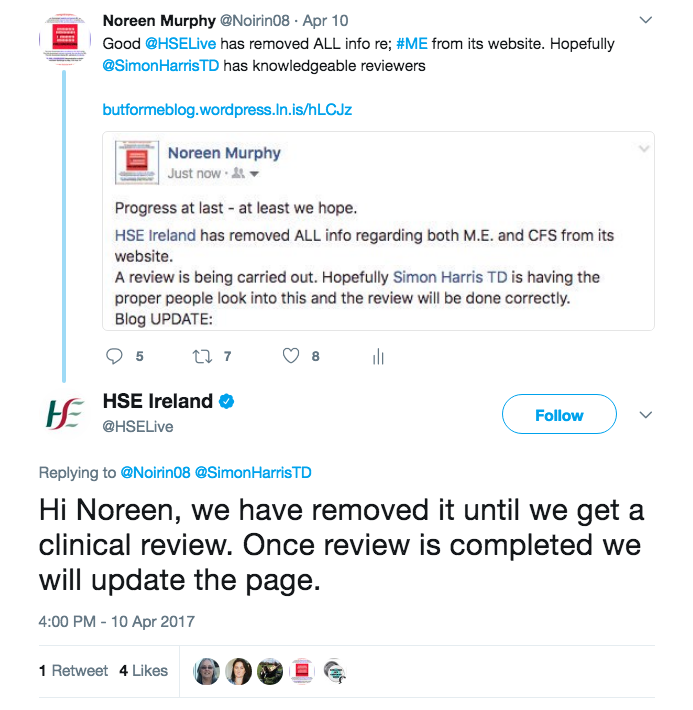 Here in Ireland, we managed to have the incorrect (NICE) guidelines removed from our HSE website. See attached Twitter pic. Me: The HSE removed all guidelines regarding M.E. from its website. GP: Oh! And what did they replace them with? LOL That’s the exact conversation. The guidelines were removed in early April, still nothing up on its website. The wonderful charity in Northern Ireland, Hope 4 ME & Fibro, generously offered a ticket and we persuaded a HSE official to attend it. Of course we wonder who the ‘clinical reviewers’ are, seeing as M.E. is not taught in Medical Schools here. But at least the harmful guidelines have been removed in the interim. NICE should, at the very least, put up a caveat stating that the guidelines are under review. We hired the right guy! And none of the other ‘MUS’ diseases mentioned are ‘functional’ either. Both those other publications were created specifically to create jobs for the CBS cult. If those involved are fully aware of the WHO classification of ME then nomenclature & unlimited Govt funding has enabled institutionalized criminal deception. The fact Govt has permitted policy that Oxford cfs is routinely used as the diagnosis in the UK nowadays, whilst masquerading & insinuating it is synonymous with ME to the media & public, it is clear criminal deception & negligence to simply deny patients access to financial & medical support. Being labelled with the intentional, conscious misdiagnosis of Oxford cfs in the UK & being fully aware of this, is obviously detrimental to a patients health & prognosis. The more people outside the patient group who understand & expose this fraud, the sooner patients can have access to appropriate healthcare & support. Thank you David & Vincent. Thank you once again David for fighting our corner when most of us cant fight back. Great work David Tuller. The reply will be very interesting. The Dutch are also fighting their version of NICE, please support their petition and send around. The Dutch psychosocial promoters are big allies of the Wessely school here in the UK and are working in collaboration with Esther crawely so it’s very important to support this petition. Thank you once again David. Your razor-sharp analysis of the issues is always very welcome. The more you subject the UK Government and regulatory institutions’ roles in the ME scandal to such scrutiny, the more they look like willing accomplices in what has happened. It seems to me that these people have either known full-well what they’re doing or have been negligent of their responsibilities. The evidence suggests that they’ve been both wilfully ignorant and knowingly blind to the deception that has been inflicted upon patients. Having now realised how badly they’ve got it wrong, it looks like they’re now in full cover-up mode. Excellent letter! I look forward to the response. Also, given there is a question mark over the NICE Guideline illustrated by its being reviewed, if doctors use the extant Guideline to pursue CBT and GET therapies which go on to cause harms, who exactly can be held responsible for those harms whilst the Guideline languishes in this limbo? Hopefully NICE will suspend CG53. If not, how about another petition to Andrew Dillon. The previous one by the ME Association was successful and contributed to the current review. Nice work David, thank you and Vincent for providing invaluable service to Public Health David. The issues you raise in this letter to Andrew Dillon are reasons why some are sceptical about the decision by NICE to fully update the CG53, as this could result in reframing it as a functional neurological disorder under the umbrella of medically unexplained physical symptoms. Experience shows that the narrative would go something like, “NICE CG53 topic experts advised the existing guideline was adequate, but NICE conducted a full review in response to the weight of stakeholder comments and concluded that CFS/ME should be diagnosed and managed as a functional neurological disorder under the umbrella of medically unexplained persistent physical symptoms”. areas which will be opposed by ME patients. pathophysiologically) neurological disorder whereas US considers it neurological. consider ME as a neurological disorder, no mention of functional? “Other disorders of the nervous system”. mention of PVFS, ME or CFS in that category. and GET as there is nothing wrong biologically, they say. This statement has to be withdrawn. Thank you for your excellent email. I eagerly look forward to his reply. Actually sick patients need actually real care and treatment relying on actually real science! Nice work David, thank you and Vincent for providing invaluable service to Public Health. The issues you raise in this letter to Andrew Dillon are reasons why some are sceptical about the decision by NICE to fully update the CG53, as this could result in reframing it as a functional neurological disorder under the umbrella of medically unexplained physical symptoms. Experience shows the narrative would go something like, “NICE CG53 topic experts advised the existing guideline was adequate, but NICE conducted a full review in response to the weight of stakeholder comments and concluded that CFS/ME should be diagnosed and managed as a functional neurological disorder under the umbrella of medically unexplained persistent physical symptoms”. Thank you David. For too long we have been left to suffer because of a preponderance of mere opinion and personal beliefs on the part of so-called experts who have not properly studied the disease. As patients our voice has not been heard, and at times it has been deliberately silenced. Your scrutiny and persistence is badly needed. As always, a superbly constructed letter. Many thanks. David Tuller ..Thank you for raising your voice , and increasing awareness ,of these debilitating diseases . I sense an unstoppable army is on the move . Yes! Some are being carried , by you & their friends [ As was the sick of the palsy , to the master ] But the surge towards truth , and healing has begun . Thank you so much for asking these very important questions! Hopefully letters like this also show that the decades of nobody caring about ME and Gremlin-jokes as answers are over. Excellent letter. Thank you, Dr. Tuller and Prof. R! !